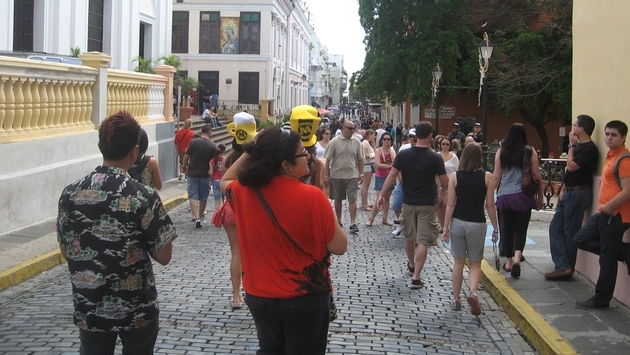 Puerto Rico is enjoying a record run of cruise ship passenger visits. Officials at the Puerto Rico Tourism Company (PRTC) report the island hosted 17,847 passengers Tuesday aboard six cruise ships, an all-time, one-day record for the destination. Tuesday’s total eclipses the previous record of 16,396 passengers set only three weeks ago, on Feb. 4, 2015. Puerto Rico’s Old San Juan cruise ship pier has enjoyed a string of strong performances since late last year, hosting 15,776 passengers on Dec. 31, 2014 and 16,712 passengers on Jan. 8, 2015. The pier hosted Royal Caribbean’s Quantum of the Seas, Disney Cruise Line’s Disney Fantasy, MSC Cruises’ MSC Divina, Carnival Cruise Lines’ Carnival Glory, and the Holland America Line ships Eurodam and Nieuw Amsterdam on Tuesday. Puerto Rico will host a total of 19 cruise ships this week, including vessels from Celebrity Cruises, Club Med, Norwegian Cruise Line and Silversea Cruises. “The arrival of the 17,847 cruise passengers represents an economic impact of about $2 million to the economy of Puerto Rico,” said Luis D. Muñiz Martínez, PRTC’s deputy director. “Our efforts to promote the island as a cruise destination continue to make Puerto Rico the five-star destination of choice in the region," he added. In recent years Puerto Rico’s government has launched numerous initiatives to increase cruise ship calls at the Old San Juan pier, including a “major remodeling” of Pier 3 to accommodate the largest cruise ships, said Mari Jo Laborde, PRTC’s chief sales and marketing officer. “Cruise passenger movements have increased 50 percent in the last two years,” she said. Puerto Rico surpassed 1.5 million cruise passengers during fiscal year 2014, a total Laborde called “a benchmark historical high for us, up from around one million passengers two fiscal years ago.” The December visit by Quantum of the Seas made the ship the largest ever to dock in Puerto Rico, she said. Rodriguez added, “We have returned trust to the Port of San Juan's cruise industry, projecting an even greater increase in this important sector over the next [several] years."